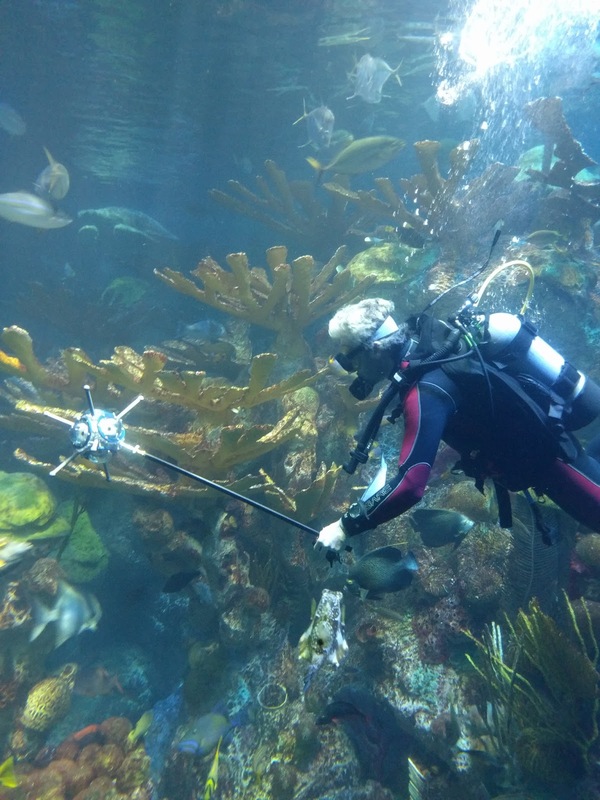 Just a few snaps from our day at the Aquarium—without another soul around except for the aquarists, divers and biologists taking care of the animals. Yup, the Aquarium was closed today, but the animals were well cared for by Emily, Daire, Luigi, Glenn, Liliana and Christine. Photographer Keith Ellenbogen also came by with one of his nifty cameras. 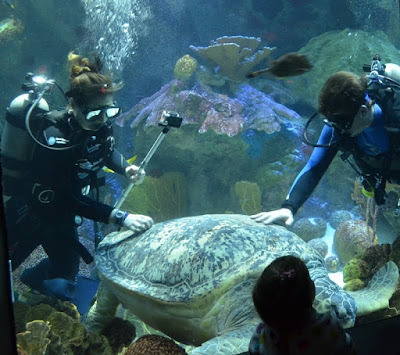 Hopefully we'll get to see his 360˚ pictures of the Giant Ocean Tank soon! big tank to snag some 360˚ photos of the reef and its residents. 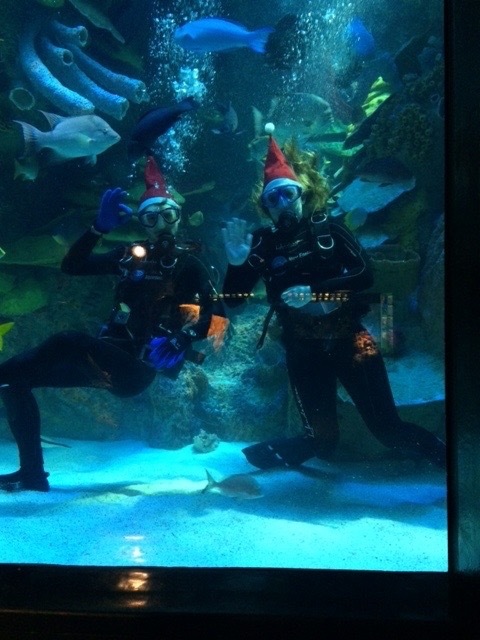 Hope you enjoyed the day, whether you spent it with family by a Christmas tree, enjoying this unseasonably warm weather or underwater! Happy Holidays! 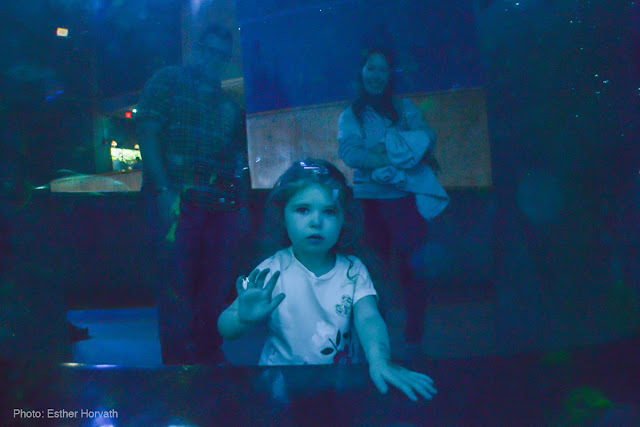 Don't forget that the Aquarium will be open again tomorrow morning, so you can see all the Giant Ocean Tank residents for yourself starting at 9 a.m. School vacation times can be busy, so here are our top five tips so you can plan a trip to Central Wharf like a pro! 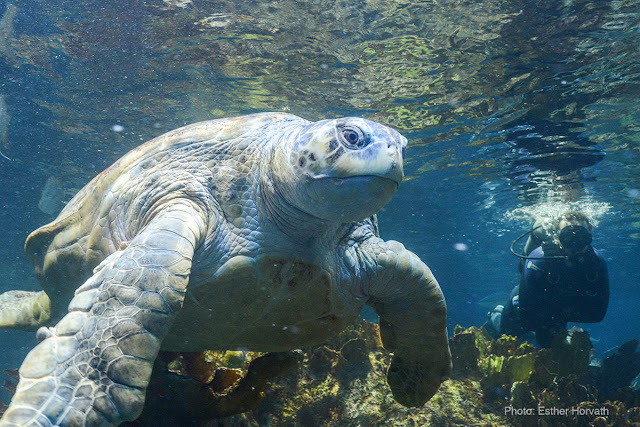 See the turtles in person! 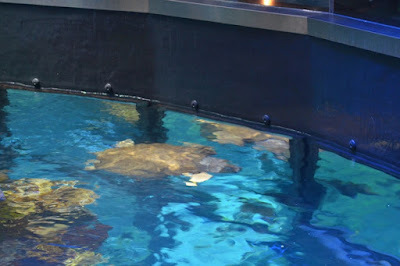 Plan a visit to the New England Aquarium. Buy tickets now. 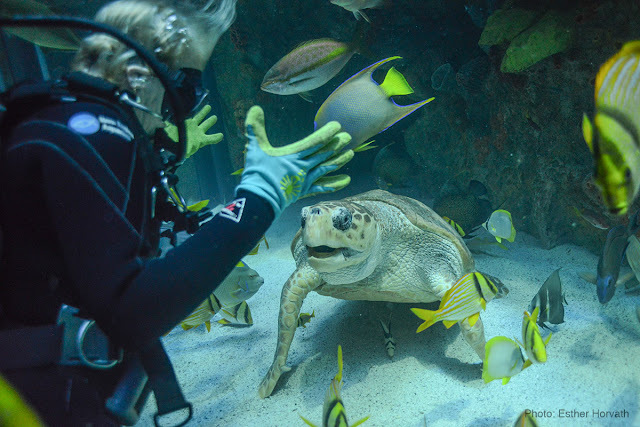 Recently photographer Esther Horvath slipped into the Giant Ocean Tank with her camera to meet our loggerhead sea turtles, Retread and Carolina. 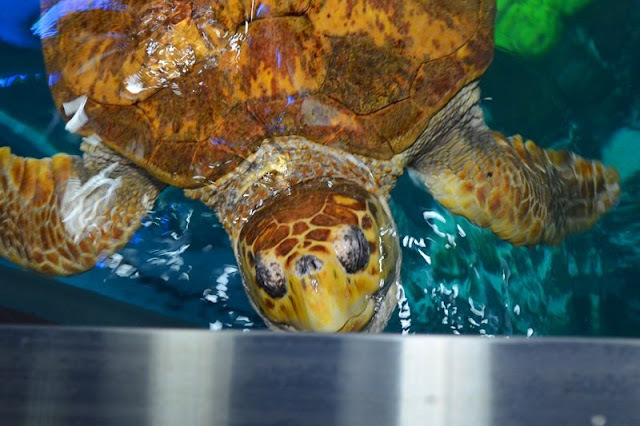 Esther has been working on a long-term project documenting sea turtle rescue, which included spending a lot of time with our rescue and rehabilitation team. Since Retread and Carolina also came through our rescue and rehab program and were deemed unable to be released, Esther wanted to include them in her rescue and rehab documentary. Most of the time her photo focus was on them. But then she met Myrtle. Of course she fell in love with the stage stealer, and her focus changed. She was really interested in how Myrtle interacts with the staff, so she took a lot of photos of me and Myrtle hanging out. Through the course of two days and many dives, Esther managed to capture some lovely images of our beloved reptiles. 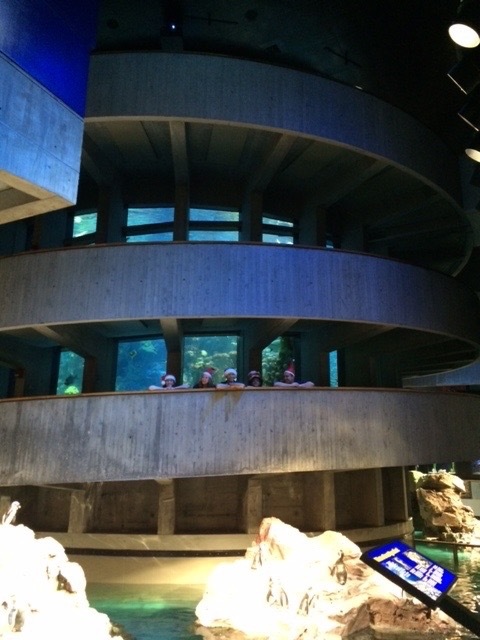 She even found time to connect with visitors through the glass, including this charming moment shared with a young person, which was also documented from the other perspective and shared on Facebook. From the inside looking out, remember this post? Esther's work has appeared in Hungary's National Geographic. While we cannot read the article it is a thrill to see the Giant Ocean Tank sea turtles and the team that keeps them healthy get some international attention. We are grateful to her that she shared her images so that we can share them with you, too. See more pictures of Esther's time at the Aquarium on her website. Not a creature was stirring, not even a.......turtle? With the Christmas holiday fast approaching, many families will be reading Clement Clarke Moore’s famous poem “A Visit from St. Nicholas”. Even if you aren’t familiar with the poem, the winter solstice is a few days away, bringing with it the shortest day of the year. With dark and cold conditions aplenty, it’s certainly a good time for a nap. 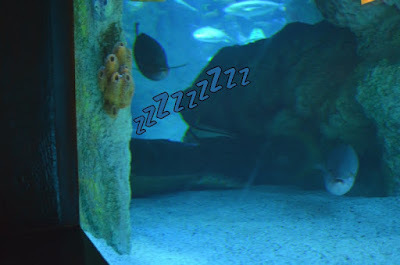 And no one does napping better than the sea turtles of the Giant Ocean Tank! Visitors often see a seemingly lifeless turtle on the bottom of the GOT and become quite concerned about the turtle’s well-being. Believe it or not, these turtles are just snoozing! Like many of us, the turtles like to get some much needed shuteye. 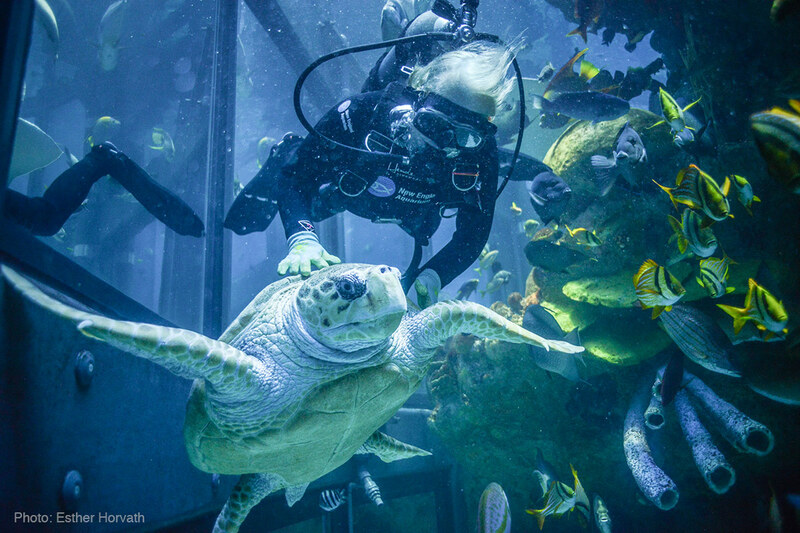 And as they can stay underwater for two hours or more, visitors may see the turtles in the same spot at both the beginning and the end of a visit! Sea turtles were built for life under the waves, as that’s where they spend most of their time eating, mating, migrating or sleeping. So how can they stay underwater for so long? A bunch of things! First of all, sea turtles are really quick at breathing. Just a couple of seconds are needed at the surface to replenish their lungs with new air, allowing for a quick oxygen fuel-up before a dive. Waiting to see Myrtle break the water surface of the GOT? Don’t blink…you might miss it! Once the air is in the lungs, there’s a lot more surface area than us humans for gas exchange, and more oxygen can be absorbed quickly into the body. 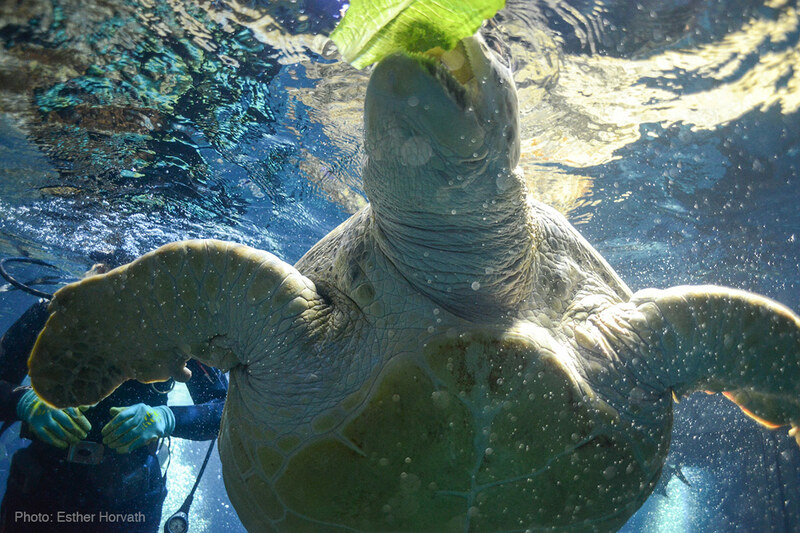 With that newly-absorbed oxygen in their lungs, blood and tissues, turtles are really efficient at utilizing ALL of it. And because they are not using as many muscle groups when they are napping, metabolic rates slow down and oxygen lasts longer. Add in other things like specialized respiratory passageways and a tolerance for low oxygen conditions and you’ve got some turtles that can take crazy long naps for several hours! 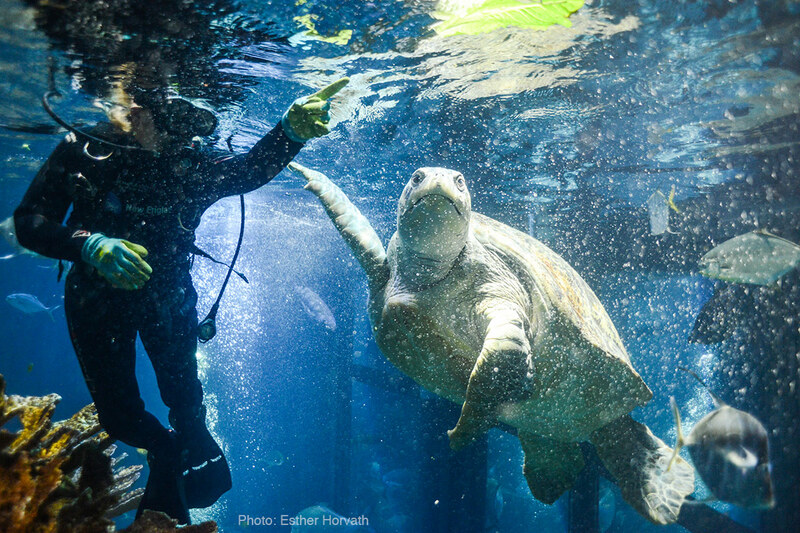 With three turtles currently in the exhibit, you may think it’s easy to see them. It may be tricky, however, as each one of them takes several naps throughout the day. Fortunately, there are favorite nap spots in the exhibit. 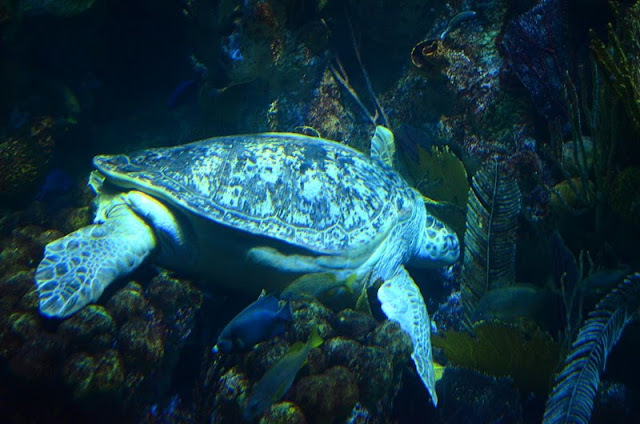 Take a look under the coral overhangs by a bottom sandy section of the exhibit and you may find a loggerhead turtle. For Myrtle, check on the top of the coral reef. In either location, you may just see a turtle “settled down for a long winter’s nap”.